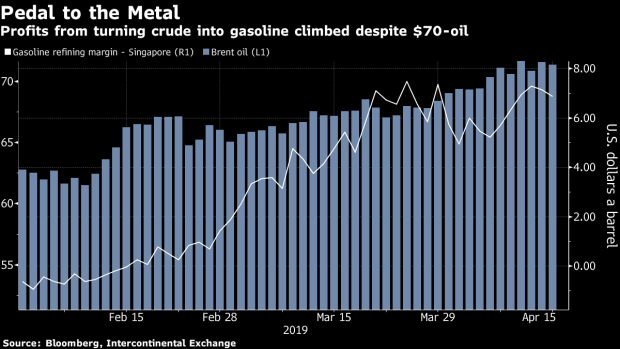 (Bloomberg) -- Oil’s march back toward a four-year high is now facing some roadblocks in the form of demand in Asia, though the path may clear to allow further gains later this year. While the current rally in global benchmark prices to over $71 a barrel will put pressure on government finances in Asia’s import-dependent nations, the level of fiscal stress typically doesn’t determine their crude purchases. Instead, the volume of shipments is influenced by the state of demand for fuel from industries and consumers in the world’s biggest oil-consuming region. In a discouraging sign for oil bulls, some indicators of consumption such as diesel profit margins have shown signs of weakness recently. That may hamper crude’s rally, which has so far been driven by OPEC’s output cuts and concerns over tight supplies. Still, market watchers see the effect as temporary, and predict fuel demand will rebound later in 2019. “Demand for crude in Asia and other regions is directly dependent upon downstream fuel margins,” said Tushar Tarun Bansal, trading and downstream expert at McKinsey & Co. “In the near term, what we’re observing are weak margins and higher-than-usual planned refinery maintenance in Asia,” said Singapore-based Bansal. The following charts show the state of fuel markets in Asia and the outlook for the coming months. The effect of fuel margins on purchasing patterns was illustrated in China last year. Asia’s biggest crude importer received record foreign supplies near the end of 2018, a result of purchase decisions made about 60 days earlier when Asian refining profits were near their highest level for the year. The nation’s largest-ever oil haul came shortly after Brent futures topped $86 a barrel. In the following months, the country’s imports fell, even as crude slipped into a bear market, coinciding with a drop in returns from making fuel. The profit from turning crude into fuels in Asia slumped to $2.75 a barrel, the lowest in over two years, in January after averaging almost $6 in the second half of 2018, according to data compiled from Oil Analytics Ltd., a firm that tracks hundreds of refining margins worldwide. While this so-called crack spread has since recovered to nearly $5, it’s still well below November levels. The recovery in overall fuel margins from their January low has been supported by gasoline, demand for which has been boosted by everything from massive campaigning activity ahead of Indian and Indonesian elections to government efforts to lift voter sentiment. Moreover, unplanned refinery outages at American plants and falling U.S. inventories also boosted margins for the fuel at a time when Asian facilities are shutting for annual spring maintenance. All that’s helped returns from making gasoline surge to a profit from a loss in January. The fuel is now at a premium of about $7 a barrel over Brent crude, compared with a discount of over $2 in late January, according to data compiled by Bloomberg. Meanwhile, concerns over global growth and the impact of the trade war between the U.S. and China -- the world’s two biggest economies -- are weighing on margins for diesel, according to industry consultant Energy Aspects Ltd. Still, profits from making the fuel, which is used in factories and trucks, are set to rebound in coming months. That’s because tankers across the globe will probably switch to cleaner diesel from more-sulfurous fuel oil in the run up to the implementation of stricter ship-emission standards mandated by the International Maritime Organization from the start of 2020. “The longer diesel margins stay low -- which reduces the incentive to maximize production now -- the more likely crack spreads will explode in the fourth quarter,” said Nevyn Nah, head of east of Suez products at Energy Aspects. “Markets need to be patient” to see the spike, the Singapore-based analyst said. Industry consultant Wood Mackenzie Ltd. sees higher gasoil returns in 2020 as demand for low-sulfur fuels climb on the back of new environmental regulations. The company estimates diesel will widen to a premium of $19 a barrel to Brent crude. The spread’s currently at about $12.50, data compiled by Bloomberg show. Several recent developments are raising optimism that concerns over global economic growth may be overdone. Keys gauges of factory strength in China and the U.S. strengthened in March, and the two countries seem to be inching closer to a trade deal, and the Federal Reserve hit pause on interest-rate hikes as other central banks delivered stimulus. That could support returns from making fuels such as diesel. The International Energy Agency cut its growth forecast for global refinery operating rates for this year by 400,000 barrels a day, reflecting “unfavorable crude market fundamentals,” according to the group’s monthly Oil Market Report. In the fourth quarter of 2019, however, run rates are expected to rise by 1.2 million barrels daily versus the same period a year earlier as new refinery projects start.